Today, I am very happy to share with you an interview with Jena Leigh, the Author of the popular paranormal young adult series Variant. 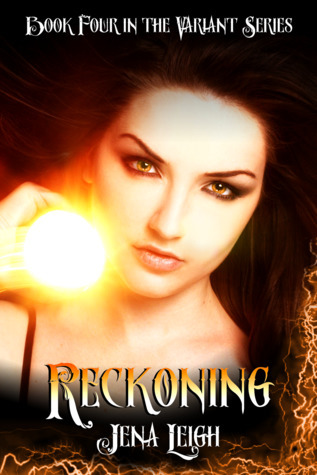 She has just released the fourth installment of the series, called “Reckoning”, which you can find on Amazon right now. Details of the book are below the interview. Hi Jena, thank you for agreeing to this interview. I am looking forward to sharing your answers with our readers. How did you come up with the idea for the Variant Series? The inspiration for the Variant Series as a whole came from many different places, but the original spark for Revival came in the form of my morning coffee. One day at the coffee shop, the barista had drawn the shape of a phoenix into the foam on my latte. The image set my mind to wandering and I spent the next half hour writing out a scene where a teenage girl was being chased by a wall of flames through a burning bookstore. That piece would eventually become the opening scene of Chapter Four in Revival. Can you give us a hint to what we should be expecting in the fourth Variant Series novel, Reckoning? In Reckoning, the stakes are definitely higher than they’ve ever been for Alex Parker and the Grayson family. Now that they’re in an all-out war with the Agency to protect the future of their kind, a single wrong move could spell disaster. You’ll be seeing a lot of familiar faces coming back for this one, and learning a lot of new things about your favorite characters—both good and bad! Anywhere and everywhere. I seem to do my best work in unfamiliar places. I’ve written on planes, at the mall, in doctor’s office waiting rooms… If I have my computer or a journal with me, I’ll usually try to get a few words on the page. There’s something about traveling that helps me to tune out distractions and focus, while at the same time inspiring my writing. Do you decide character traits before you sit down to write the book, or as you go along? Character traits are usually decided on as I write. I very rarely have an entire character in mind when I sit down at the keyboard. I usually start with a few random traits—a name here, a face there, a quirk or two to distinguish them, an important bit of backstory that forever changed their life or altered their personality—and then the personalities of my characters become clearer to me as I make it further into the story. Oh, that’s a tough one! It seems to change from day to day. Right now I’d probably have to say that it’s a tie between Declan’s sister Kenzie and a fire-wielder/hitman named Carson Brandt. Kenzie’s sassy, sarcastic and I can always count on her for a witty rejoinder. Brandt is honest to a fault, cares little for what anyone thinks about him, and is so fluent in snark that I’m pretty sure it’s his first language. Their scenes are always enjoyable to write. Tell us about the biggest challenges you face in your writing process. I think the biggest challenge I have is in plotting out a story. When it comes to my writing, I’m a total pantser and I despise outlining. Writing only feels natural to me when my characters are the ones telling the story. I love being just as surprised as my readers are when something unexpected happens in the narrative. When you’re working on a series, however, that doesn’t always work. You need to have some idea of where the story is headed before you begin; otherwise it’s very easy to write yourself into a corner. If you could give a young writer any tip, what would it be? Write constantly and read everything you can get your hands on. It seems like such an obvious piece of advice, but it’s quite possibly the most important things you can do to improve your writing. There are two! Right now, I’m focused primarily on outlining the fifth book in the Variant series. It will be the last novel for this particular story arc and it’s a book that I’m pretty excited to write. The other project I’m working on is a trilogy of prequel novellas that will tell the story of John Grayson’s original team. In the Variant Series novels, we’ve only been given their story in pieces, shaded by the bias of each survivor. The novellas will tell more about what really happened to Cil, Brandt, Grayson, Samuel Masterson, and the others. Rock star! I mean, really. Who hasn’t wanted to be one at some point? Aside from writing, I’m incredibly passionate about music. I love it, but I haven’t got a lick of talent (although that doesn’t stop me from singing at the top of my lungs in the shower every morning). If there’s not a song playing in the background somewhere, I usually don’t know what to do with myself. And now I want to introduce you to Reckoning! Alexandra Parker came home from the past only to find herself in the middle of an underground war—one that could affect the fate of Variants everywhere. Fighting an all-powerful government agency is tough enough, but when a secret from John Grayson’s past comes back to haunt them all, the group’s united front begins to crumble. And when Alex’s own painful memories threaten to push her past her breaking point, the uprising stands to lose its most powerful weapon. With their lives and their freedom on the line, can Declan, Nate, and the rest of the Grayson family hold it together long enough to bring down Director Carter and derail Brian’s apocalyptic visions? As Alex struggles to master her most volatile ability yet, only one thing is certain: the uprising’s cold war with the Agency is about to turn red hot. He split the fiery orb he held in two before allowing each of them to double in size—and then he lobbed one of them directly at her head. Standing as they were, only a few yards apart, she barely had time to dive out of the way. The fireball hit the ground just behind her, singeing the earth to a blackened char before fizzling out. Alex got back to her feet. Again, Brandt split the orb he held in two before sending one spiraling toward her face. This time she was ready and managed to catch the blazing orb just a few fleeting inches from the tip of her nose. She shrank the ball little by little until she was able to force it to blink out entirely. Distracted as she was by her efforts, she almost failed to notice the next orb hurtling her way. It took everything she had to react in time to catch that one, too, and dissolve it. This time, she glanced up to discover two fiery masses spiraling in her direction. Again, Alex was forced to redouble her efforts in order to catch both simultaneously and dissipate them. Soon Alex’s world consisted only of the flames hurtling toward her and the effort it required to force each orb out of existence. Within another two minutes, the number of orbs being launched simultaneously in her direction had hit double digits. Drowning beneath the constant onslaught, Alex grew desperate. Instead of slowing, the speed and strength of his volleys intensified. Exhaustion turned swiftly to rage. Alex growled as she countered orb after orb, dissolving each one with barely an instant remaining to prepare for the next explosive torrent. “Stop calling me little girl,” she spat through clenched teeth, struggling to hold back the barrage. She could feel the anger burning through her, hotter even than the fire she wielded. Alex could feel her strength—and her ability to focus—waning. She had seconds at most before her concentration gave out and the hailstorm of orbs made contact. I love that you have a blog about books and book reviews! Reading is such a gift and I feel fortunate that my parents fostered the love for reading in me as a child. Great work! Thanks for joining in the Friendship Friday blog hop. thank you for having me. I also think that the love of reading is a gift, that should be nurtured. I hope I did a good job in doing so with my children. You are so lucky to have parents who loved you that much, to give you this awesome foundation. Many blessings!